Priceless proof in the absence of memory. My paternal grandfather died at the age of 86 when I was twelve years old. Given the fact that he lived just around the next block during the entire time I knew him, it seems only natural that I would have many memories of our brief time together. Yet, sadly, I cannot recall any specific moments that we shared. I only remember what it was like to sit quietly in his tiny living room when Dad and I would stop by for a visit. The two of them would drone on about topics that did not interest me at all, and I would pass the time by rocking in a swivel chair and scanning the latest National Enquirer that had been left on the end table. Sometimes there would be something interesting on the TV, but most often not. I can only remember Grandpa as a mysterious and taciturn widower, Grandma having died when I was six. He did not live alone, though, as he had a faithful dachshund named Gidget for companionship. A highlight of visiting Grandpa, one might think. But as much as I found my grandfather to be remote, his little dog was completely unapproachable. Apparently she had once suffered abuse at the hands of youngsters, rendering her hostile toward anyone who happened to be in the same peer group as her former tormentors. Between Grandpa’s perpetual frown and his vicious wiener dog, I didn’t care to linger when we visited. Not that there weren’t subtle signs that there was far more to this man than his introverted nature suggested. The white tank top undershirts he favored in summertime revealed a faded rose tattoo, a real curiosity in an age when getting inked was a badge of nonconformity. I tried not to stare at it, just as I averted my eyes from his hand that was missing half of its pinkie finger. For many years I mistakenly believed that it had been mangled in a train coupling. Lord knows where I got the idea, as the dull truth was that Grandpa had simply got his finger caught in a factory machine press. Perhaps my brain just embellished the romantic character that started to form in my mind as I grew older and heard tales of my late grandfather. Raising half a dozen kids during the 20’s and 30’s could not have been easy, and Grandpa did whatever he could to make ends meet. Most famously, desperate for a job to support his family, he managed to secure a job as a typing instructor despite the fact that he did not know how to type. How he got the job remains a mystery, but he apparently managed to bluff his way through the obligation by a regimen of self-instruction that kept him one lesson ahead of his students. During another lean period, he was literally down to his last dollar, which he gambled on a tip book from a bar. Amazingly, the investment paid off handsomely enough to get him by. I learned that he eventually was a successful seller of cemetery plots, a somewhat ghoulish profession for which he was once rewarded with a tie tack in the shape of a shovel. He had a spotlight mounted to his car in order to find house numbers while canvassing neighborhoods in the evening. Somehow the very idea evokes the melodrama of an old EC horror comic book. I can only guess that anyone who could manage to make a living persuading people to open their doors at night and buy a cemetery plot must have been born to sell. I found out that against all stereotypes, it was Grandpa who cooked breakfast for my father when he was young, setting a hot plate and a steaming mug of coffee before his youngest child every morning. I laughed at the story of Grandpa’s ire upon finding his car blocked by a double-parked vehicle, which he subsequently removed by starting his own automobile and pushing the obstacle out of the way. But I’m glad I wasn’t around to see the legendary poker night when he is said to have expressed his disgust at a bad game by hauling all of the gambling paraphernalia down to the basement and tossing it into the coal furnace. I am told that one of my cousins possesses evidence of the incident by way of a collection of singed poker chips. I liked your letter with the drawing of a ten dollar bill. Did you deposit your Christmas money in the bank? I’ll bet you received a number of nice gifts on Christmas Day. Did you get a sled? I hear that Lima has been getting a lot of snow, so a sled will be a lot of fun. I wish you could be with me when I take my walks along the ocean. There are many big ships coming and going, and also many jet passenger planes and Navy planes. Many people take their lunches with them and either lay in the sun or go bathing, and the children play in the sand. There has been a lot of snow in the mountains, and a lot of parents take their children up there to play in it. I will look for another letter from you soon. A big hug and kiss for you, and love and best wishes to all. P.S. I ma learning to use Norma’s new electric typewriter, so please excuse mistakes. Have you made any more plans to capture Bigfoot? How funny it is for me to read that letter today. I don’t even remember writing letters to Grandpa, which I’m guessing I might have done only at my parents’ urging. Why I would have drawn a ten-dollar bill is beyond me. I do, however, recall my boyhood fascination with Bigfoot. I took it for granted that he was real, and I once detailed how I might take him captive with the aid of Dad, Grandpa, and the hostile hound Gidget. I am certain that Grandpa’s dry humor went right over my head when I first read his letters. I enjoyed your nice letter and the interesting drawings. Thanks a lot for the Christmas seals. We went to Richard’s house in Oceanside last Sunday, and Gidget was very happy to see me. She is a lot of company for Richard, and he will hate to give her up when I return to Lima. Richard and Dave and Lee Ann and their kids are coming for a week in San Diego, and we will be at Lee Ann’s parents home for Christmas dinner. I hope you will get everything you want for Christmas. I read in the newspaper that Bigfoot has been seen in Oregon. I will watch for any more news about him, and let you know. It does not seem likely that he will be in Ohio until about next summer. Glad that you like the snow. People with children drive up in the high mountains here and bring snow home in the trunks of their cars. Rather silly, I think. Thanks a lot for the Christmas seals. P.S. You are a very good letter writer. Why, that isn’t the Grandpa I remember visiting! How could I have read words like those and so quickly forgotten them? But then I was quite young, too young too see the humor and too unsophisticated to appreciate how carefully my grandfather had written in a style that was easy for me to understand. The thought that he took the time to write when he could have spent a few more moments relaxing in sunny California would never have occurred to me. The last letter, written within two years of his death, reflects a change in tone. Grandpa recognized that I was a little more grown up, being ten and all, and perhaps it was time to address me differently. He still, however, took delight in providing me with Bigfoot updates. I enjoyed your recent letter and am glad you are doing well in school, even tho you do not like it too well. It is best to have a good education. It looks like bad weather is about over in Lima, and you can have a lot of fun with your bike. Are you going to play ball this summer? The last I heard about Bigfoot, he was seen somewhere in Idaho. If he ever comes to Ohio, we will put Gidget on his trail. We took a long ride in the mountains yesterday. Many wonderful things to see. I have reservations for my trip home on the 7th of April. Will be happy to get back. 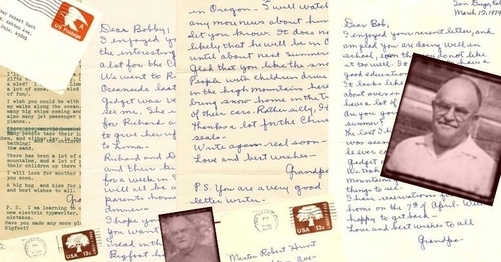 I regret that I never knew Grandpa better, but I am very grateful to have the letters that he wrote to me so long ago. Not only do they prove to me that my grandfather did, indeed, have great affection for me, but they also provide me with a valuable lesson. It’s always a good investment of time to put your love of others into writing. You never know when those words will communicate what you no longer can. 1 comment on "Grandpa, Sasquatch & Me"
Another excellent article, Bob! I too have letters from Grandpa and each one is addressed to “My Darling Christine.”. They are real treasures. I remember both him & Grandma very well. They liked to visit & shop in Toledo when I was young & would frequently bring little white paper bags of light & dark Opera drops (huge gumdrop shaped chocolate-covered vanilla creams) – each bag just for me alone, quite the treat for the eldest of 6 kids – they were 2 people in my life who consistently gave me unconditional love – maybe their entire brood of grandkids felt the same way, they were extremely good at loving & supporting us.